Dry Sahel seems to be a hostile living environment in the dry season. Nevertheless it is home to a charismatic species found across the Sahel region of sub-Saharan Africa from Senegal east to the Red Sea coast of Sudan and Eritrea I Africa: the Black Bush Robin or Black Scrub-Robin (Cercotrichas podobe), an inhabitant of the hot arid subdesert and savanna with scattered shrubs or acacia bushes and groves of date palms. During a Rockjumper-tour to bird northern Cameroon in April 2017, bird-lens.com also visited the wide Sahel belt in the northern part of Cameroon. Bird companions in the area going up to Waza NP are the Quail Plover or Lark Buttonquail (Ortyxelos meiffrenii), Scissor-tailed Kite (Chelictinia riocourii), Black-headed Lapwing (Vanellus tectus) and the Cricket Warbler or Cricket Longtail (Spiloptila clamans). 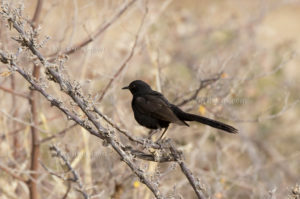 Normally shortly after we left the car, at least one individual of a Black Scrub-Robin could be detected in or besides the low, thorny shrubbery.